You may just visit Barrow in Furness during a holiday to the south western Lake District. Holidaymakers like to explore and if self-catering in a cottage, need to replenish their stores and buy their favourite drinks and foods to enjoy during their holiday or may wish to see a film at the multiscreen cinema during their stay. 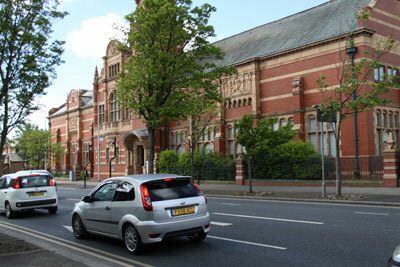 The sprawling town of Barrow in Furness lies at the south western extremity of the Southern Lakes. Initial impressions for visitors are of an industrial town with a fair number of factories. The town hall is a large and impressive red sandstone building. There is a number of handsome buildings in the town, built of the same red sandstone, once of which is a Salvation Army citadel and another is the Nan Tait Centre which houses various organisation’s offices. There is a large indoor market which was opened by the Queen in 1971, a long high street with all the usual brands and chain stores. A number of shop units were empty, a sign of a slowly dying high street, a symptom of our times. An enormous bronze sculpture of skilled workmen stands in the centre of the high street, representative of the skills found in barrow in Furness. A few men lounge beside the sculpture; perhaps their skills are no longer required or maybe they failed to make the grade. There is an overall atmosphere of a struggling economy. The majority of eateries in town are fast food outlets. There is a large Wetherspoon’s food pub opposite the Salvation Army Citadel, a Thai and Indian restaurants nearby. Do take a look at holiday cottages in and around Barrow in Furness. The countryside and coast near the town are very pretty. There is sailing available by the sea and on Windermere and Coniston. This could be as simple as paddling a kayak or racing with a motor launch. Holidays are all about fun. Do what gives you pleasure in Cumbria.